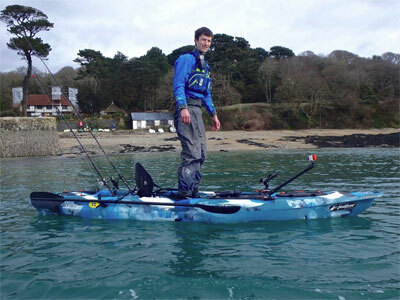 A Superb, Feature Packed, Stable Kayak Fishing Sit On Top Perfect For Paddling On A Range Of Waters. The Feelfree Moken 12.5 Angler is a fantastic platform from which to fish from, the Moken 12.5 is stable and easy to paddle with plenty of room to make you feel extremely comfortable. 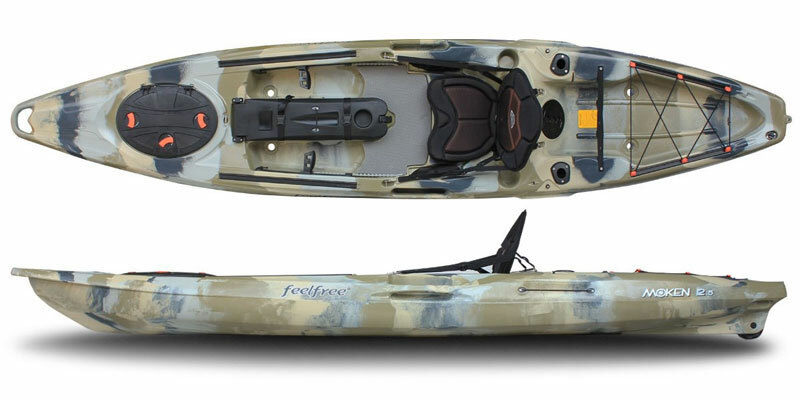 This kayak is so stable that Feelfree actually incorporated a stand up pad to allow you to stand up cast whilst out on the water. The included Feelfree Kingfisher offers a perfect back support and fantastically padded seat base making being out on the water a pleasure. The Moken 12.5 Angler comes equipped with 2 rear mounted flush rod holders as standard and Feelfree have mounted them perfectly for trolling. To the front of the Moken12.5 are 2 slide track rails allowing you to customise where you would like to add further forward mounted rod holders and accessories by simply purchasing A Feelfree Slide Track Mount Plate (Sold Separately). This mounting plate system is easy to fit, remove and adjust when out on the water and means you don't have to drill holes in you kayak to permanently mount accessories. Storage on the Feelfree Moken 12.5 is aplenty a large click lock hard oval hatch to front allows access to the internal space of the Moken 12.5 meaning storing trolleys and dry bags is easy. An easy access large mid pod storage hatch gives you the perfect place to store lure and gear you need close to hand, a twist lock rear hatch allows you to store less important items further down the sit on top and has been know to be useful should you wish to add a fish finder and mount the transducer inside your fishing kayak. To finish off the storage options in style Feelfree added a large rear tank well with bungee's, mesh pockets next to the seating positing and 3 drinks bottle holders 1 either side of the seating position and 1 on the mid storage pod. Moving this kayak around has been made easier by the side moulded carry handles and the bow/stern carry handles for easier car topping. A wheel in the keel of the Moken 12.5 means you can load up with all your gear and wheel over hard flat surfaces, should you need to go over more lumpy terrain we would recommend taking a look at the C-Tug Kayak Trolley as this will break down and stow nicely in the front oval hatch. In order to prolong the life of the wheel in the keel's axle you will need to occasionally wash off dirt and salt water. Feelfree send the Moken 12.5 Angler rudder ready (Rudder Kit Sold Separately), this kit is available and easy to fit. Read a review of the Feelfree Moken 12.5 Angler here.